A lot of people ask me what fly I use on particular bodies of water here in Southern Utah and my answer is consistently “whatever is hatching.” One of my favorite things about fly fishing is you are imitating the current food source of the fish you are targeting and this food source can change literally within minutes. The fish can and will key in on one particular insect. This means learning the natural bugs and their corresponding fly patterns is pertinent for a successful day on the water. One way to to get ahead of the learning curve is to hire us as your guide! But until then, we have another way to help you out. One fly that helps bridge that gap is the Pheasant Tail Nymph. The Pheasant Tail is a pattern that imitates multiple insects and is popular around the world. Developed by famed UK river keeper and fly tier Frank Sawyer in 1958, it is considered one of the oldest “modern” nymphs. It imitates mayfly nymphs which are hatching a good part of the year and in smaller sizes can imitate midges which are hatching all year. I mostly fish them with a bead bouncing off the bottom but you can also trail them behind a dry fly a couple of feet unweighted during a hatch to imitate an emerging insect. I generally tie them with natural, brown and sometimes black pheasant tail feathers. A good tip is to carry a black or brown sharpie and if the insects really are darker then just color the fly. I fish them in sizes ranging from 14-20 with size 16 probably being the size that matches most natural insects. 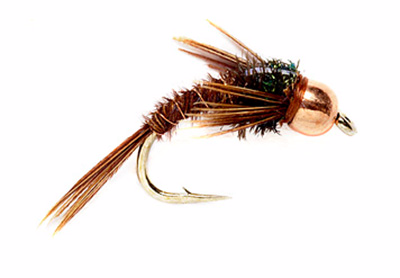 The Pheasant Tail Nymph is easily a top 5 pattern, if not the top nymph pattern to fish. If you don’t have some in your fly box then you better get some asap!